The U.S. dollar index (/DX) is strong. Since early May, the /DX has climbed 5.30. What might this mean for stocks? The U.S. dollar index (/DX) is strong. Since early May, the /DX has climbed 5.30%. Potential catalysts for this rally include Brexit and the ensuing global uncertainty, and demand for safe-haven investments. Additionally, last week's June labor report renewed talk that the Federal Reserve might sneak in a rate hike in 2016 after all. 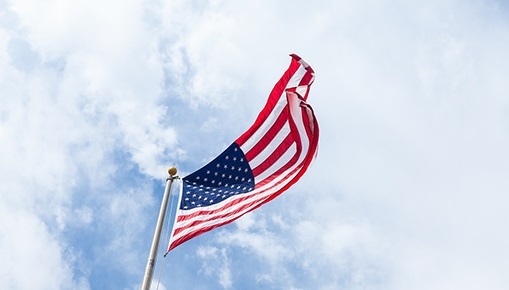 "Uncertainty over Great Britain and the spillover impact into Europe should continue to strengthen the dollar," says JJ Kinahan, chief market strategist, at TD Ameritrade. Since March 2015, the /DX has been stuck in a trading range between roughly 92 and 100. 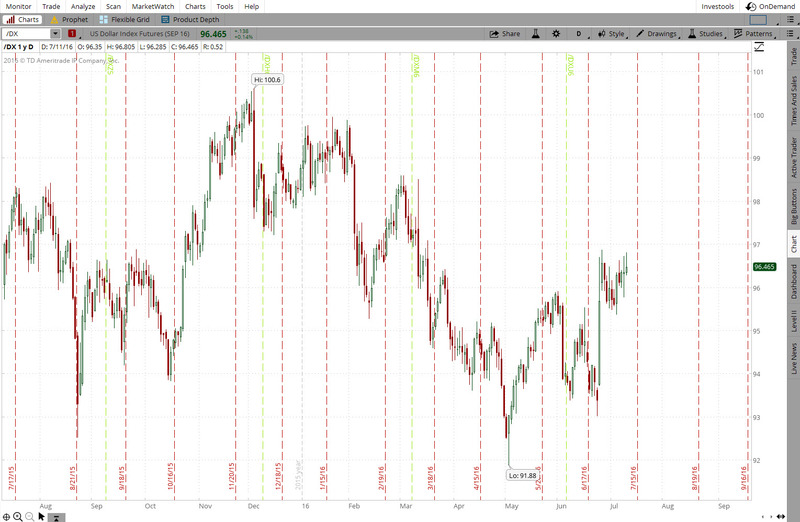 Check out this trading range on a weekly chart of the /DX in figure 1. FIGURE 1: U.S. DOLLAR INDEX (/DX) WEEKLY CHART. The /DX is trading in a long-term range between approximately 92 and 100. Image source: the TD Ameritrade thinkorswim® platform. For illustrative purposes only. Past performance does not guarantee future results. Might this mean more trading within the range ahead? Kinahan pointed to the one-year-plus trading range in the /DX and said, "The market already had major news with Brexit and still hasn’t broken out of the range. With the presidential election coming up, it’s hard to conclude the dollar would see news that could break it out of that range." The level of the /DX, or generally the strength or weakness of the dollar, impacts the stock market, particularly stocks of large multi-national companies. For large U.S. multinationals that sell goods and services overseas, a rising U.S. dollar can put a crimp into the profits. "If the dollar is strong, it does make a difference for those companies. It may be difficult for them to increase prices or even maintain sales at current levels," Kinahan says. Keep an eye on upcoming Q2 earnings announcements because you may hear evidence of this, Kinahan says. What you need to know: In the short-term, the /DX could be building a potential "bull flag" pattern within its trading range. What is it? A bull flag is continuation pattern that could open the door to additional strength in the dollar if the pattern confirms. How does that work? Well, technical traders generally ascribe to the belief that "it's all in the charts." That simply means that all known fundamental information is priced into the current market price. Technical traders simply look at price charts to understand current trends and potential future market moves. Nuts and bolts: A flag pattern forms with a large range. In this case of the /DX, look at the action on June 24. This is called a "flagpole" that’s part of the bull flag pattern. The subsequent sideways action forms the potential flag portion of the pattern. Here's the trick: In order to actually "confirm" the potential bull flag pattern, a strong upside breakout is need above the top of the pattern, or in this case the 96.70 area. From there, technical traders do a little math. They calculate the distance of the "flagpole" and add that to the breakout point to calculate the measured move objective of the bull flag pattern. Even if you’re trading stocks, the dollar index can be worth watching, Kinahan says. "Right now the U.S. dollar index has a negative correlation to stocks. When the dollar goes higher, the S&P 500 generally goes lower," he says. Forex accounts are not protected by the Securities Investor Protection Corporation (SIPC).Forex trading services provided by TD Ameritrade Futures & Forex LLC. Trading privileges subject to review and approval. Not all clients will qualify. Forex accounts are not available to residents of Ohio or Arizona.